At any academic conference or gathering, the plenary talks are the backbone, the time that brings everything together and is the foundation on which the rest of the conference is metaphorically built. Because this is the Hemingway Society, it’s not enough to have a day of plenary talks. This has to be special, something unique and different. 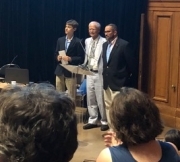 This was the case this year as, for the 2018 conference, we were able to hold all of our talks in the famous Sorbonne. Getting to spend time at this most hallowed of academic institutions set the tone for what was to be a fascinating and illuminating day. One thing I’ve noticed about the Hemingway Society, and that I wrote about for the last conference in Oak Park, is the wide range of talks and presentations one can see at the conference. I like that about the Society’s conferences.This year’s all-day plenary session was a sterling example of this variety. The sessions covered an impressive number of topics related to Hemingway and each speaker brought his or her own distinctive approach to the presentation of the material. The day started with a very special treat that Stoney, our inimitable conference co-director, was able to bring together. A military brass band was waiting on the stage of the Amphithéâtre Richelieu and played before the proceedings began. The band regaled us with renditions of “The Star-Spangled Banner” and “La Marseillaise,” along with other military and marching songs. After that rousing introduction, the first session focused on the topic of war and memory. Moderated by Alex Vernon, the session featured two talks by Steven Trout and Annette Becker. Steve’s paper was a consideration of the commemoration of war, focusing on World War I and how Hemingway engaged with those issues in his writing. Steven used a memorial to those who served in World War I from Hemingway’s hometown of Oak Park as an example. Annette’s talk centered on the legacy of the war, but paid particular attention to Hemingway and his life after the end of the Great War, both for him and for all involved. The next session of the plenary day engaged with this issue of memory and remembrance in its own way. Adam Gopnik, author and writer for The New Yorker, used his time to address Hemingway’s relevance in the 21st century. Gopnik crafted a narrative that traced why Hemingway’s presence in the culture at large waned in the decades following his death, how he has had a resurgence of late, and how he speaks to our moment in the 21st century. After that, there was a respite for lunch. 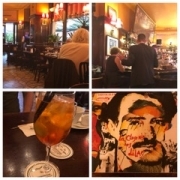 Your humble correspondent spent that time, along with good friends and fellow Hemingway Society members, at a lovely French restaurant resplendent in green décor as though it were inside of an absinthe bottle. Returning to the Sorbonne, we were treated to a session of songs and poems from the Great War, led by Stoney and featuring contributions from Sarah Gannon. Stoney seamlessly transitioned into his introduction of Terry Eagleton, who gave a talk on Modernism and language, using Hemingway as a touchtone or entry point into that larger, theoretical discussion. But that wasn’t all there was to Eagleton’s presentation as he closed by singing a lovely Irish song that wow-ed and delighted those assembled. The following sessions were interested in things that were “new,” whether it be a panel on some of the forthcoming books on Hemingway or Quentin Miller’s talk on James Baldwin's essay “The New Lost Generation” and how it and Baldwin engage with Hemingway. The final act of this plenary day commenced with an address by Joseph Flora, president of the Ernest Hemingway Society, when he both awarded the first Blake Scholarship Award to Michael Montgomery (an undergraduate at UC-Davis) and announced that the 2020 Hemingway Society conference will be held in Wyoming and Montana. Following that address was the Society’s membership meeting (when the winners of both the Hinkle Travel Grant and the Lewis-Smith-Reynolds Founders Fellowship were announced) and walking tours of some of the neighborhoods and sections of Paris that relate to Hemingway and the literary milieu of Paris.